CDOT uses a variety of products to treat Colorado highways during a winter storm. All of the products contain salt with added corrosion inhibitors used to prevent or remove the build up of ice and snow on roads and minimize the impact on vehicles. Anti-icing prevents snow and ice from bonding to the roadway, making it much easier for plows to clear the roads when combined with de-icers. CDOT's anti-icing product is applied hours before a storm and is a part of a pretreatment strategy designed to be more proactive while fighting adverse road conditions. De-icing breaks the bond of already existing snow and ice. The de-icing products dissolve downward and penetrate until they reach the pavement. 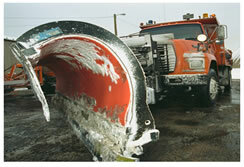 De-icers melt the ice and snow it may be easily removed by mechanical means such as plows. They are not necessarily intended to clear every bit of ice and snow on the road, though the goal is to keep roads wet. Both anti-icers and de-icers are winter road treatments that work as freezing-point depressants and are the most desirable and environmentally friendly way to treat winter weather roads. CDOT makes an anti-icing brine mix in-house at a rate of 42 cents per gallon. This product is applied hours before a snowstorm or icestorm and will appear as white stripes on the roadway once dry. Unlike other anti-icing products used throughout the country, CDOT's brine mix contains a corrosion inhibitor, which helps prevent damage on both vehicles and infrastructure. Once snow begins to fall, or the temperature drops below freezing, crews will stop using the anti-icer and switch over to de-icers. Due to a lower freezing point, it can substitute for regular- and cold-temperature magnesium chloride. See CDOT's Liquid De-Icer Standards & Specifications. Sand or Sand/Salt Mixture—Mainly used in the high elevations and the eastern plains where more extreme cold temperatures exist and more traction is needed. See CDOT's Granular De-Icer Standards & Specifications.